Combining impressive grating laser and intense strobe effects with a colorful PAR light, the low-profile Flat Storm is just right where space comes at a premium. The versatile fixture sports six long-life 9 watt RGB LEDs for rich color mixing, a total of 24 cool white 0.5 W LEDs to fire the high-speed strobe while the Class 3R grating laser utilizes red 100 mW and green 30 mW diodes. For extra flexibility, the Flat Storm includes effective single pixel control and the option to use the PAR can, strobe and laser functions individually. With 4 DMX modes, sound activation and built-in automated programs plus master, slave and standalone capability the Flat Storm offers multiple control and application alternatives. The rugged compound housing features a low-noise fan for cool and quiet operation, a bright 4-button display for intuitive configuration and a key switch to prevent unauthorized access. The Flat Storm provides 3-pin DMX and IEC power inputs and outputs enabling easy daisy chaining and an emergency stop switch interlock connector. A great performer in the most diverse lighting applications, the Flat Storm comes with a convenient infrared remote control and adjustable mounting bracket. 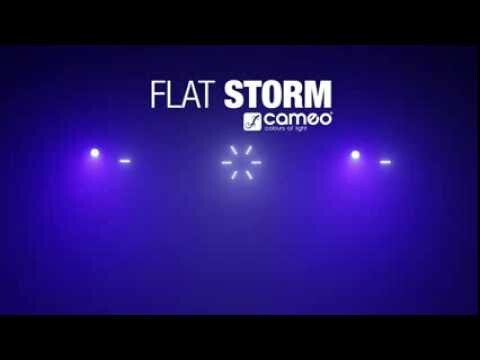 Considering purchasing the Cameo Flat Storm? Have questions? Ask people who've recently bought one. Do you own the Cameo Flat Storm? Why not write a review based on your experience with it. Seen a video for Cameo Flat Storm online or have you own video? 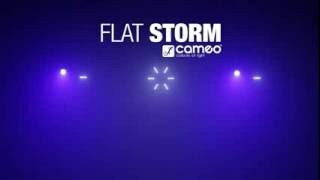 Check out Cameo Flat Storm on DJkit.com!